What is it about teenagers, thinking that their parents were practically born in the Stone Age? It is an unfortunate set of circumstances that led me to have to write, for the second time this week, about another instance in which I am accused of being older than the hills. To make it worse, the accuser wasn’t even one of my own children. Close, though: it was the younger boy’s best friend. I was driving the two of them home from scouts on Monday night, and I decided to stop for Shamrock Shakes for the three of us (plus Jim and the older boy), to celebrate the grand news we had just received about the older boy’s college scholarship. Anyway, where was I? Oh yes, on my way to McDonald’s. Note that the younger boy knew that it was probably best for him to stay out of it; he didn’t say One. Word. Suddenly I was a volcano, erupting with knowledge that he probably could have cared less about, but that had to be shared at that moment. And once again, I was driving a car that was completely silent, punctuated only by the sound of milkshakes being sucked up through their straws. Sometimes when we aim to prove how we are so NOT old, we prove that we are anyway. *I believe his health class screened the movie “Supersize Me” last year. **This was indeed a moment of irresponsible parental lecturing. I would have totally taken his shake and slurped it for myself. I would like a Shamrock Shake. But there ain't no way I could go to McDonald's at this point in time without ordering fries. And both of those things together would be the downfall of this diet, which is going so well. But man…those are so good. I love that you love McDonald's so much. And it's hysterical to me that the younger boy didn't say a word…and even funnier that he didn't warn his friend to shut it…he just let him continue! I want to come to Chicago. Today. Ah, but you do remember the introduction of Happy Meals, The McNugget, salads, the Sundaes in 3 flavors and when the pies were fried, yummmmm. Come to think of it, everything on your childhood menu except the fliet-o-fish and McRibb (didn't have that on the east coast) were burgers and fries. Okay. I'm done now. This was fun. This is funny! You gave it to him 🙂 Hee Hee! I had one of those moments today when I ask my coworker, "Did you hear Corey Haim died?" Oh lord! She's only 22 but still…hello The Lost Boys…I know it was the 80s but still. 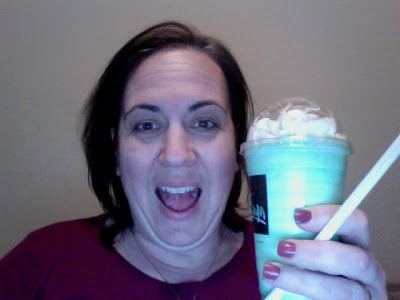 now I'm craving a shamrock shake. I know what I'm getting for dessert today! by the way- I gave you an award! Dang. I'm with Momo Fali…I would have taken his shake and enjoyed it myself. LOL! I am with you on this though…I can't count the times I heard stuff like "Were there televisions?" "Where there this or that?" Grrrrrrr! If it had been me, I probably would have said something like: "That's true… they hadn't invented meat yet. We had to chew on wheat stalks. But it cost a nickel!" Then I would have pulled over and shoved him out. Well, I bet HE is too young to remember when McD's had PIZZA. Now that was an awesome thing to be old enough to remember. Sigh. I still crave that damn pizza. I had a kid a little later in life so I just hope I can still hear when Braden's friends make fun of me. I can just hear your lecture in my head. And it is hilarious. Next post: This One’s For Huckdoll, But You Can Enjoy It, Too. Previous post: BREAKING NEWS: It’s Official!